Armstrong Metal Fest is gearing up to once again bring heavy metal thunder to the British Columbia city this July, and organizers have now revealed the lineup for the event's 11th edition. More than 30 bands will perform at Armstrong's Hassen Arena on July 12 and 13. 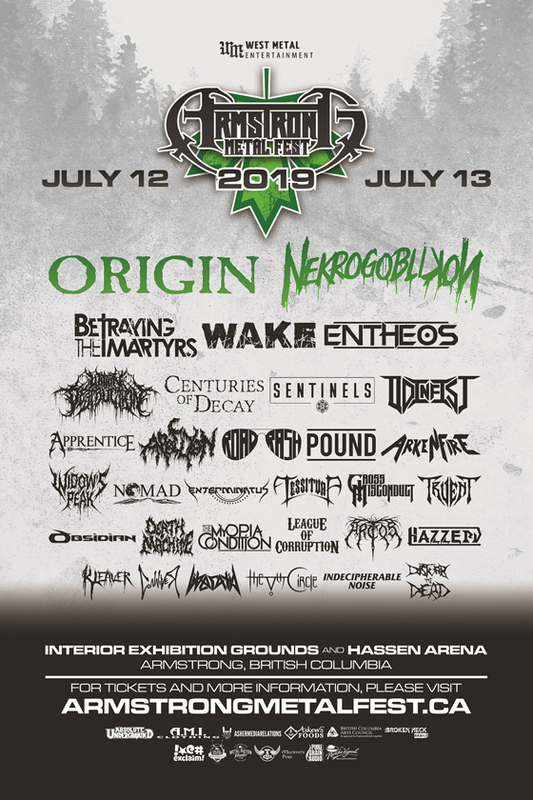 Topping the bill are American tech-death outfit Origin and melo-death crew Nekrogoblikon, followed closely by Betraying the Martyrs, Wake, Entheos, Centuries of Decay, Sentinels and more. You can pore over the complete lineup of acts set to play the fest below. I'm super excited about our lineup this year, we've got some of my drumming heroes in Origin and Entheos, the super fun Nekrogoblikon, our first opportunity to have some bands from overseas in Betraying the Martyrs and Within Destruction, a few of our brothers from the states, and so many killer bands from around Western Canada. Our original dream of bringing the European metalfest feel to Canada is really taking shape, and I'm so grateful to still be a part of this. Full festival passes are available for $135 and provide holders with access to the festival grounds, thrash wrestling, camping and arena. Further information on day passes and other ticketing options can be found through the fest's official website.